I’m sprouting at my cabin. You can sprout even if you don’t have much water–just rinse all your sprouts with the same water and then drink the rinse water. 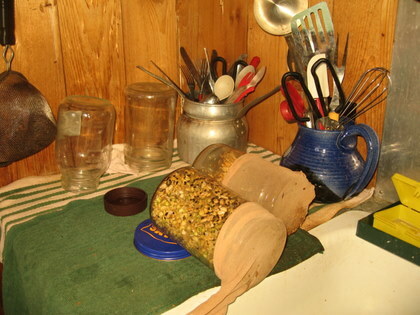 All you need to sprout is some jars, some seeds, and some thin material to pull over the jars so you can drain them. Nylon knee highs work great but any thin sock will work. You don’t need special sprouting seeds. These are the things I have been sprouting: lentils, raw shelled sunflower seeds, black sesame seeds, fenugreek, broccoli seeds, clover, alfalfa, mung, wheat berries. Start with clean socks and jars. I boil the socks and then pour boiling water into the jars and let them soak for a few minutes. I reuse the hot water for drinking. Put some seeds in your jar–it’s okay to mix them. In the morning, take out your tea bag, put your sock over the jar lid, and drain water into container. Lay jar on side and prop up the end so any excess water can drain. Rinse them again before you go to bed and drink rinse water. Keep rinsing twice a day until the sprouts are the way you like them—about 4days—takes longer if your cabin gets really cold over night. You don’t have to keep them in the dark. Just keep them out of direct sunlight. In the winter, I have an idea to put the jars in to an insulated cooler at night with a hot jar of water to keep them warm through the cold nights. What is the green tea bag for? Have you considered making kefir, sauerkraut, or kombucha? Sauerkraut might be a good idea for winter. I tried making something called rejuvac. It was ferreted sprouted wheat…not great. Do you have to make kefir with milk? I’ll look into the kombucha. Yes, you need milk so it might be difficult in the summer. Kombucha is difficult to make during winter when it is cold.